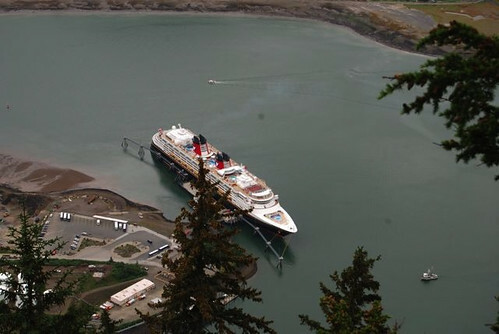 Our 2nd port of call on our Alaska Disney Cruise was Juneau. We didn't have any plans to do anything other than wander around town, so Mik opted to stay on the ship. We were going to scout out a place to later take him off and do a family photo in Juneau, but it ended up being a great choice for him to skip Juneau entirely. Juneau is not horrible accessibility wise, but it certainly was the worst of the ports and it is partially because of Mik's hatred for buses. There is on dock right by the edge of downtown, but the other docks are at least a mile bus ride away and ours was the closest of them. They did offer a free shuttle including ones that had lifts, so not a real issue beyond Mik hating bus rides in his chair and not worth the fight with him to just go take a photo. You can also walk into town on the sidewalk, but note that it is a very hilly area and you deal enough with inclines just going a few blocks around town. Hence, another reason why it wasn't worth trying to convince Mik to get off in Juneau. Not saying Juneau is not worth it, as Mom and I really enjoyed riding the tram part way up the mountain (it is kind of pricey, though). The tram is accessible except the trails up on the mountain are pretty rugged. 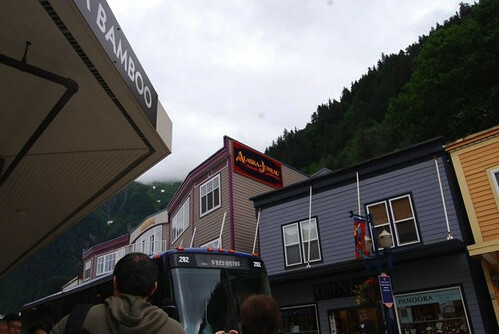 However, expect Juneau to be a more intense city to explore with there being not much of interest near the dock and tram other than shops and having to deal with hills and several blocks to get to even the closest attraction besides the tram. Certainly still was very doable for us to do with Mik other than his attitude towards buses and him not being interested in any of the things to do.